My Grandmother immigrated to the United States during WWII and as a child I enjoyed all of her London/British prints, books, and knick-knacks. My parents recently moved and in the process found my childhood Paddington Bear, from there this project took off! When it comes to nurseries I like them to be comfortable spaces for the whole family to spend time together. I keep things fairly traditional with vintage elements, fun artwork, a variety of patterns and textiles, and classic furniture. We started with the walls. This room received board and batten trim as well as a nice, thick crown molding. A dark blue paint called, Knighthood, was applied above the trim. Framing tea towels was a great way to add a large pop of color to the walls and keep the costs low. I added extra dimension to the space with the patterned fabrics for the drapery, pillows, and linens. We finished this room using family keepsakes and on-theme accessories. 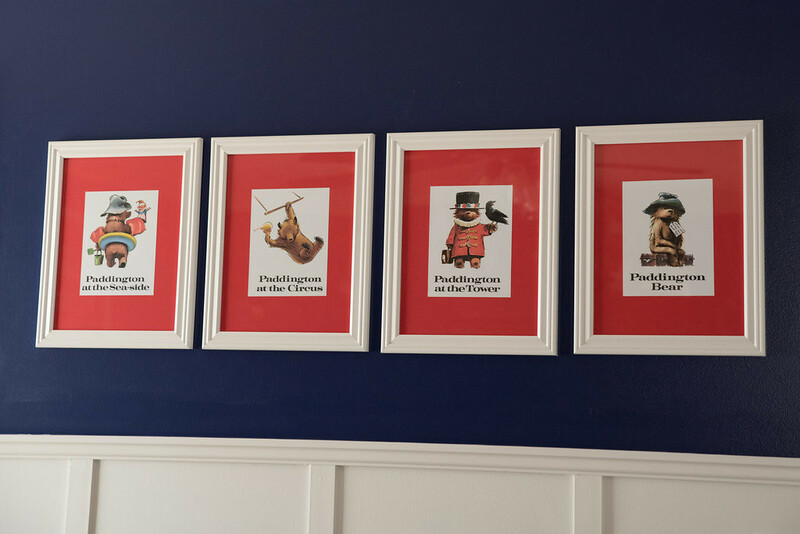 Paddington Bear Prints: I used the title pages from a book called, "Paddington's Picture Book." Cadbury produced a series of tins called "Vehicles of London" we used the double decker bus and the trolley. How can you pick just one?! My top three favorites -- the Alice Tait Map of London tea towel, my childhood Paddington Bear, and the Cadbury Tins my grandmother gave me for the nursery. You should check out the Paddington Bear collection by Trend Lab! !